Today, when mostly CAD and computer graphics rule the field, the following selection of images from the past seems so exciting. Make sure you click on the "expand" button on each picture to see all the delicious little details! And feel free to add your favorite cutaway building in the discussions below. Section showing the interior of Wyld's Monster Globe, which stood in Leicester Square, London, from 1851 to 1861. An artist's impression showing of the Vehicle Assembly Building at the Kennedy Space Center on Merritt Island, Florida, 1974. 1950: Diagram of a typical subway bomb shelter proposed for New York City in a 104 Million dollar bomb shelter program outlined by the Board of Transportation. 1968: Drawing of the 10x10 foot wind tunnel at the Glenn Research Center. 1955: the 16-Foot high speed tunnel (HST) at the Langley Research Center. Cutaway illustration of the Neutral Buoyancy Simulator (NBS) at the Marshall Space Flight Center (MSFC), ca. 1968. Architect and city planner Oscar Newman's plan of a massive underground sphere beneath Manhattan, 1969. A family in their backyard underground bomb shelter, early 1960s. Wylfa Magnox nuclear power plant, Wylfa, Anglesey, UK, 1965. An early space station concept drawing appeared in the 1959 Space The New Frontier brochure produced by NASA. Fred Freeman's impression of a lunar base, 1952. Crossing the River Mersey, Liverpool. Atomic power plant of the future imagined by Ray Pioch in the Fifties. 1962: The Space Needle, Seattle. Palace of the Soviets, Moscow, concept by Boris Iofan, 1936. 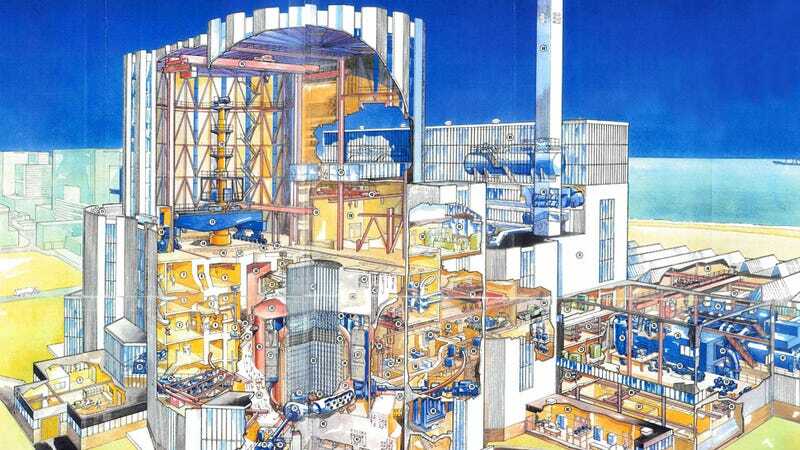 Piccadilly Circus cutaway, London Transport Museum, 1989. Illustration by Gavin Dunn. Draft artwork for the Naval Cathedral in Kronstadt by Vasily and Georgy Kosyakov, 1903. 1859: design of Chersones Cathedral of St. Vladimir by David Grimm. East-west cutaway. "Aerial cutaway view of the Bank of England from the south-east" – a watercolour by Joseph Michael Gandy, 1830, courtesy of the Trustees of Sir John Soane's Museum. The Metro Rail station at 5th and Hill, Los Angeles, 1983. Plan of BBC television centre, London, 1958. Bonus photo: Architect Paolo Soleri rests in front of his “3-D Jersey,” a cutaway model on display at the Corcoran Gallery of Art in Washington, Feb. 17, 1970. It’s his idea of a supersonic jetport and city that might be built on the mud flats of New Jersey across the Hudson River from New York City. The structure he suggests is not just a jetport but a city, including hanging sunlit gardens, terminals and offices, hotels and theaters, and dwellings for one million.